being little • bristol uk fashion & lifestyle blog. : rust. Today I went into town to go Christmas shopping... it was a bit of a fail, as I ended up buying some trousers, socks and a t-shirt for myself. This evening I've made up for it a bit, buying a few presents and planning a few more to get when I have the money! It's been quite mild the past couple of days, so I just threw on my duffle coat over this outfit. The top is from H&M, the belt, tights and shoes are all Primark, and the skirt is second hand from East, and will soon be available in the Being Little Shop as it's a little tight around my waist! Your waist is tiny! Love the outfit, and the little bits of blue in your hair. you look lovely! i just adore your skirt, such a pretty colour. This skirt is such an amazing colour!! I'm in love! Haha, I always do the same sorta thing with Christmas presents, thank god for online shopping!! super cute outfit! haven't even though of Christmas shopping yet - EEKS! really love your top, im really impressed with h&m atm :) that skirt is a beautiful colour too, perfect for autumn. I'm a huge fan of the dark rust color, just bought a piece yesterday resembling it! the top is lovely, you look gorgeous! is it recent H&M, i'm after one like that myself. I'm going to pop to the shops to look for a secret santa present but I bet I will end up getting something for myself haha. i love the color scheme. that skirt is just the best! Ooooh, this is just too cute! I absolutely LOVE your skirt. It reminds me of one I really wanted at a vintage store in Sydney years ago, but I didn't have the cash to buy it haha. I've regretted that ever since! Iv added a little link/button click thingy to my blog to recommend yours, I hope thats ok :) haven't explained very well what I mean haha! I'm obsessed with rust this season, and you wear it so well! I love it with that leopard print blouse! Love the leopard print top and it looks great tucked in. Very autumnal! 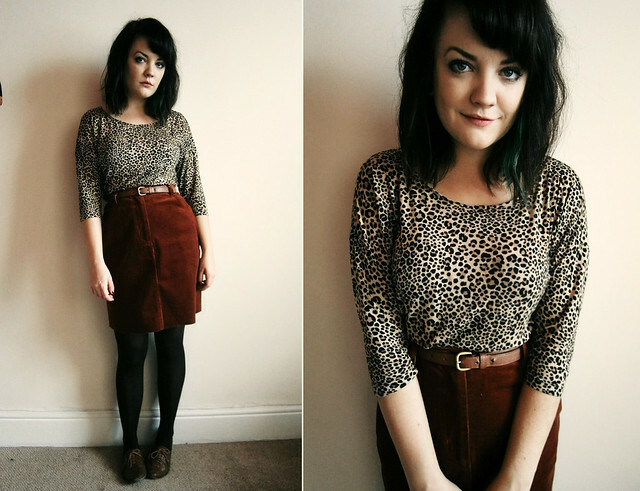 i love the combination of the leopard top and the red skirt!